This year, Remembrance Sunday falls on the 10 November. 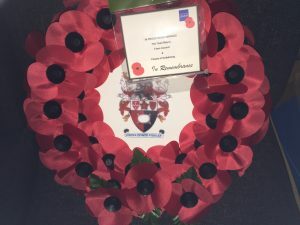 In Godalming, we will gather in the St Peter & St Paul Parish Church at 9.45am for a Service of Remembrance followed by a Remembrance Day ceremony at the War Memorial in the Phillips Memorial ground at 10.50 am. Anyone wishing to join the parade should be at Waverley Borough Council’s car park at 8.55am prompt to march off at 9.00am. Approximate timings listed below. During the week prior to Remembrance Sunday, there will be a public collection organised by the Royal British Legion. We ask everyone to support this most generously in order that the Legion may continue not only to help those who have been permanently disabled by war but also their families when necessary. As is the custom in Godalming, the Mayor and Town Councillors will help with this collection at Sainsbury’s Godalming on Saturday, 9 November from 9.00 am until 4.00 pm.